NETWORK FINALS: The rerun of THE GOLDBERGS gained 0.1 in final numbers. A couple of less-rounded finals: STAR ended up at 1.26, and THE 100 at 0.43. CABLE HIGHLIGHTS: The opening episode of BET’s MADIBA miniseries was a mere 0.16, somewhat shockingly lower than last week’s 1.81 for the NEW EDITION STORY premiere, even given the more serious subject matter. It was followed by the premiere of THE QUAD at 0.28. The scripted and unscripted lead cable shows of the night were at nearly identical numbers. On the scripted side, the season finale of History’s VIKINGS gained 0.04 to 0.71, and lead-out SIX was up 0.02 to 0.40. TBS’s FULL FRONTAL dipped 0.03 to 0.48. On FXX, IT’S ALWAYS SUNNY IN PHILADELPHIA ticked down to 0.37, and MAN SEEKING WOMAN ticked up to 0.11. Syfy’s THE MAGICIANS took a hefty 0.15 hit from last week’s season premiere to 0.37, and the 95-minute season premiere of THE EXPANSE was at 0.25 (on par with its regular timeslot debut last season at 0.27, and better than last week’s 2-hour 0.23/0.16 season finale of INCORPORATED). USA’s SUITS rose 0.03 to 0.34. TLC’s TOO CLOSE TO HOME lost 0.02 to 0.32, airing after the unscripted MY 600-LB LIFE, which was up 0.02 to 0.47. On Comedy Central, WORKAHOLICS fell 0.08 to 0.26, and JEFF & SOME ALIENS was down 0.03 to 0.17. Bravo’s GIRLFRIENDS GUIDE TO DIVORCE held at 0.15. POP’s SCHITT’S CREEK was at 0.08. In the unscripted realm, Discovery’s ALASKAN BUSH PEOPLE was on top, up 0.03 to 0.72, with lead-out BERING SEA GOLD at 0.39. VH1’s BLACK INK CREW jumped 0.11 to 0.65, followed by AMERICA’S NEXT TOP MODEL at 0.23. ESPN’s NBA doubleheader featured Minnesota vs. Cleveland at 0.61, and Chicago vs. Oklahoma City at 0.57. HGTV’s PROPERTY BROTHERS climbed 0.07 to 0.51. As has become usual, Fox News had 3 shows in the Top 12, led by TUCKER CARLSON TONIGHT at 0.48. 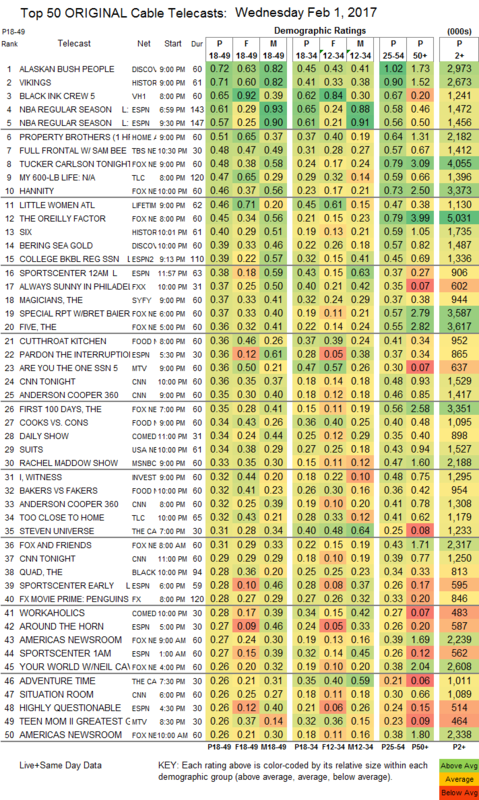 Lifetime’s LITTLE WOMEN rose 0.09 to 0.46, and VIVICA’S BLACK MAGIC was up a hundredth to 0.20. 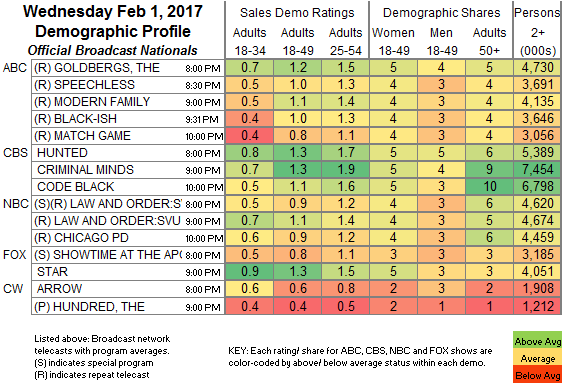 On Food Network, CUTTHROAT KITCHEN returned at 0.36, while COOKS VS CONS fell 0.07 to 0.34, and BAKERS VS FAKERS was a tick down to 0.32. MTV’s ARE YOU THE ONE ticked up to 0.36, with a TEEN MOM clip show as lead-in at 0.26, and a simulcast AMERICA’S NEXT TOP MODEL as lead-out at 0.16. Tru’s THE CARBONARO EFFECT returned at 0.20/0.14.